Many people probably know the obelisk which stands at the center of plaza or square of famous sightseeing spots such as Place de la Concorde in Paris, Piazza San Pietro in Vatican City, Piazza del Popolo and Piazza Navona in Rome, Hippodrome (Sultan Ahmet Park) in Istanbul, and so on. Those obelisks were originally erected at the entrance of Ancient Egyptian Temple, and then transported to Ancient Roman Empire which was enchanted by the obelisk, and some of them were made in the Ancient Roman Empire's territories. Although about 30 ancient obelisks are currently well maintained and stand at the public places (plaza, square, park, etc. ), but only 5 remain at the ruins of Ancient Temple in Egypt. And two more obelisks stand at the public space in Egypt. So 7 obelisks in total in Egypt. Therefore, many books and website say: "only few ancient obelisks remain in Egypt". The obelisks are often referred as a typical examples of antiquities going to foreign countries, because "only few ancient obelisks remain in Egypt" is widely presumed. Also the detailed records, stories and episodes on the obelisks outside Egypt are widely known, but on the obelisks remain in Egypt are few. As the result, "few" and "scarcity" of remained obelisks in Egypt are more emphasized. When I read such stories, I thought "it's not difficult to see all the obelisks as the numbers are about 30 in 10 countries". Also I felt the enchantment of the visiting tour, because this is not only a pleasure tour, but a World Heritage visiting tour as most obelisks are standing in the areas of World Heritage Site. Then I planned to visit every obelisks in the world. However, I unexpectedly learned many "fragmented" obelisks are not widely introduced yet, and the knowledge is limited among the archeologists only. Then I finally planned to visit all the obelisks including fragments, and observe by my eyes, and take pictures with high definition image, and report the whole stories including the provenance of the obelisks. This is the motivation for this travel, as my lifework. This website was made as the result of such visiting tours. Initially I planned to go to Egypt again in Summer 2013 as Egypt is a homeland of ancient obelisks. But I had to abandon the plan as main sightseeing spots were closed due to the sudden military coup d'etat just after purchasing the air tickets. Then I visited Italy instead. In Summer 2014, I visited Egypt which calmed down the political confusion, and also looked around the obelisks in U.K., Turkey and Israel, and then Italy again. Then in May 2015, I visited the obelisks which I have not seen in France, Italy, Lebanon, and U.K. As a result, I found that 70 obelisks including the fragmented ones, excluding 26 obelisks which remain in the Obelisk Temple in Lebanon. And, 64 obelisks (among 70) are publicly exhibited. In April - May 2016, I visited the 5 obelisks which I have not seen in Germany, Poland, Egypt, Italy, etc. At this point, I have finished the visit for all (publicly exhibited) 64 obelisks. In spring 2017, As I knew the Egyptian Collection in National Archeological Museum of Naples (Museo Archeologico Nazionale di Napoli) was opened to the public, I visited France, Egypt and Italy for the additional study of the obelisks in Egypt and visit the National Archeological Museum of Naples. Below is the tabel of contents of this website "Obelisks of the world" with the list of all obelisks I confirmed worldwide. The word "obelisk" came from the Greek "obeliskos" which means "skewer" or "spit". Ancient Greek people would have brought up the image of skewer when they looked the soaring obelisks standing in front of temples as many obelisks still remained at that time. The obelisk-like structures were made in Ancient Roman Empire, Assyrian Empire, Ethiopia, etc. not only in Ancient Egypt. In this site, the scope of the obelisk is, the ones are built in Ancient Egypt and its dependent territories, and Roman Empire's territories outside Egypt in Roma Empire Era. There is no doubt that the obelisks existing in Egypt were made in Ancient Egypt. Among the existing obelisks outside Egypt, there is the one which was built in Lebanon, under the influence of Egypt in Middle Kingdom Era, the imitation which was made in Italy of Ancient Roman Empire, and the one which was built in Roman Empire's territory such as Obelisk in Caesarea. We included those obelisks in this scope. However, it's difficult to distinguish the ones "made in Ancient Egypt" and "made in Roman Empire". In 30 B.C., Cleopatra VII killed herself and Ptolemaic Dynasty's Egypt was subverted and became a part of Roman Empire. Then in 27 B.C. the Ancient Roma has shifted to the Empire. Egypt is considered as a Roman province, but the Egypt still existed after the Roman rules were established. 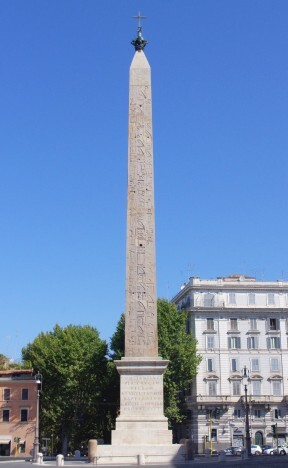 Also, some obelisks in Rome are, the stone material was quarried in Egypt and was made in Rome. And the ancient Egyptian hieroglyph was engraved on some Roman-made obelisks. In fact, many books and the websites on obelisk don't distinguish "Egypt made" and "Rome made". This website also introduce the obelisks without distinguishing both. This website will include the "Senusret I Obelisk" in Faiyum (Egypt). "Senusret I Obelisk" in Heliopolis, suburban Cairo is well-known, but the Faiyum obelisk is often excluded when the obelisks are discussed. This is probably because this has no pyramidion on top of the obelisk-like stone column. In Ancient Egypt, the obelisks are erected, normally as a pair, at both sides of the entrance of Temple which enshrines the God of Sun. In the Middle Kingdom Era in around B.C. 2000, Amun God who was a guardian spirit of Thebes and the God of Fertility was unified with Re the God of Sun (God of Amun-Re). After that, the obelisks were also erected at the entrance of Temples for Amun, such as Karnak Great Temple of Amun. On the other hand, many obelisks in Rome are standing in the Square (or Piazza ) or front of main churches and palaces. This is a mode after the Middle Ages. In the ancient Roman times, the obelisk was erected in front of Isis Temple or at the spina (the middle barrier of the racecourse) of amphitheater (or called as hippodrome). 26 obelisks remain in the "Obelisk Temple" in Biblos (Lebanon). Ancient Lebanon and Egypt traded many goods, particularly the Cedrus libani (Cedars of Lebanon) was an important product. Hence Lebanon received an influence of Egyptian Polytheism. However, "Obelisk Temple" was for the Rassap (the god professed by Canaanite and Phoenician), not Egyptian God. We introduce these mass of obelisk of the "Obelisk Temple", as a reference. In the modern age (19 Century), some obelisks were transported to Western countries, say New York, London, Paris and other locations. Some of them are stored in the Museum. We introduce those obelisks also in this website. We don't introduce the "obelisk-like construction" such as Assyrian Obelisk which is one of the collection of the British Museum, and the Obelisk in Axum (or Aksum) which was recently returned to Ethiopia from Italy. Also, we don't introduce the modern "obelisk-like construction" such as Washington Monument (Washington, D.C., U.S.) and a large obelisk in Buenos Aires (Argentina), although those obelisks are included in Wikipedia. This website is a summary of the information and data on each obelisk worldwide, based on my visit. Also, considering the conveniences for every people, such as archaeologist on ancient Egypt, who has an interest in obelisks (so-called "obelisk fan), I tried to take as much as possible sharp photo. You can access to the original fine images. Please note that some images are processed HDR in the case of backlit situation. All photos are taken by myself, and I reserve the copyright. You may use the images, but you must state the source of the images. Also, I indicated the direction; North, South, West and East of the obelisk. But some obelisks are not facing strictly to 4 points of the compass. In such cases, we used the 4 directions for just a descriptive purposes. Also, considering the conveniences for every visitor of the obelisk, we provided the route to the obelisk site with Google Map which would help you how to access there. In order to create this website, I have visited many obelisks. Among them, with a clue of only one picture of obelisk, I have visited some Museum. Although the famous obelisks (mostly standing large obelisks at famous places) are filled information, but the information is often extremely few for the obelisks which remain in the ruins and/or are stored in the museums. This fact would suggest there may be other obelisks which are not publicly known yet. If you have information on an obelisk (including fragments) of ancient Egypt and Roman Empire not listed on this website among readers of this website, I'd like to ask you to provide the information for us. I'm explaining the things which is known generally, not simply copying from other specific websites and/or books except copyright-expired sources. With regard to the Hieroglyph of inscriptions on the obelisk, there may be my misunderstanding or wrong information. Please kindly let me know via e-mail if you spot anything suspicious.